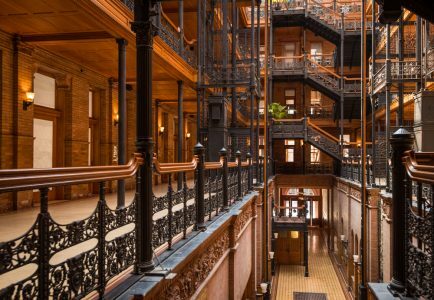 The Bradbury Building in Los Angeles CA. Designed by George Wyman and Sumner Hunt. Saved from travelcaffeine.com. The WWE starts us off with Baron Corbin. He introduces Stephanie McMahon. She comes out and “soaks it in.” Corey Graves points out the obvious, that Smackdown Live did indeed win a match in the pre-show of Survivor Series. After some bragging, Stephanie is ready to get to some new business. Corbin wants to be named GM. Braun Strowman comes out. He wants Corbin. Stephanie tells Corbin that if he beats Strowman, he’ll be full time GM. If he loses, he’s out altogether. Strowman needs to beat Corbin to get his match against Brock Lesnar. Strowman informs us that him & Corbin will have a TLC Match. Not exactly a match I’m looking forward to. Stephanie sets up a six man match. Bobby Lashley & Drew McIntyre are joining Corbin. Finn Balor & Elias join Strowman. Elias gets a spot light which is really weird since every other competitor is at ring side already. I’m hoping no one is surprised that Balor is the one taking the beating for the good guys. Elias ends up getting the hot tag since he hadn’t been in the match yet. Oh, this is an elimination match. Balor tags back in for reasons unknown to me. Flip dive onto Lashley & Corbin. Balor gets pulled off the top rope by McIntyre. He tags in and Claymore’s Balor for the first elimination. Elias ends up getting rag dolled himself. He’s a big gentleman to be tossing around. Elias gets an opening while Strowman is down. He drops a top rope elbow onto Corbin. Lashley makes the save. Elias gets tossed around outside and gets counted out. Strowman stands alone against the heels. It’s weird seeing Strowman being worked over this match. Strowman is ready to pin Corbin when Drew McIntyre assaults him with a chair. McIntyre is eliminated. The three on one assault continues however. They toss him into everything they can outside the ring. Strowman makes a mini-comeback but McIntyre Claymore’s him. The final act is Corbin picking up the top half of the steps and slamming them onto Strowman’s arm which was on the other half. I know Jeremy told me Strowman had some lingering physical issues. This could be the way to write him off for a while. Seth Rollins comes out and is not quite his peppy self. He claims that Dean Ambrose never returned his texts and calls. Rollins wants Ambrose to come to the ring. Ambrose says that they’re paying for their sins when they were in The Shield together. Ambrose reveals that he’s in the arena somewhere. Rollins goes in search of him. Renee Young still doesn’t know anything about Ambrose’s mind set. Graves even seconds the thought after a search back stage by Rollins. She doesn’t know why she should know anything. The last time I knew that little about my (now ex)wife’s mind set, we got divorced. Bayley & Sasha Banks are taking on Nia Jax & Tamina. Alexa Bliss joins the announce team. Banks gets the beat down. Bayley gets the hot tag. She also gets caught with a huge super kick. Bayley gets things turned around again. A cross body gets a two count. Jax using her hand right hand as a new WMD is cracking me up. Samoan Drop for the win. Charley Caruso gets interrupted by Dean Ambrose, who is stealing Aaron Maguire’s material by saying “Pardon the Interruption.” He tells Rollins to meet him in the usual Shield location. Lucha House Party is taking on The Revival. It’s a three o two match. The first big move is a knee breaker as Kalisto went for a kick. Lince Dorado gets a hot tag. He delivers. A pinata distracts Dash Wilder. Dorado kicks him in the face. Shooting Star Press for the Lucha House Party win. Seth Rollins says it was too far when Ambrose said that Roman Reigns is getting what he deserves. Ambrose walks in the back ground of the Rollins interview. Titus O’Neil gets screen time to tell Rollins he just missed Ambrose. Ronda Rousey is focused on Nia Jax. She is ready to beat Jax. After that, she’s ready to resume her fight with Charlotte. Rousey is making the (most recently) argument of Roman Reigns that being at Raw to defend the championship is what champions are made of. Not sitting at home. Hilarious that I’ve read that Heyman is helping with her material and he’s basically arguing against his own client. Rousey wants an opponent tonight. Corbin came out and tries to talk her out of the match. Rousey is too fired up and insists on the match. Mickie James is the one to challenge her. Rousey makes short work of James. Triple of Piper’s Pit. Arm Bar for the tap out victory. Nia Jax & Tamina come out and confront Rousey. Jax polishes her fist but leaves Rousey untouched. Bobby Roode & Chad Gable are taking on AoP with Maverick. Akam & Rezar look terrifying as usual. Gable gets an arm bar on Rezar to break up a beat down. Bobby Roode continues the momentum. He tags back in Gable. He gives a top rope sunset flip into a pin for the quick win. Dean Ambrose taunts Rollins again. He tells him to forget the Reigns stuff because it isn’t about that. It’s about a bond between brothers being crushed. He wants to break Rollins. I’m just going to say that Ambrose wasn’t wearing his wedding ring. They could have a story line divorce, right? Seth Rollins is just leaving because he needs to catch a flight. He gets him at TLC so he’s just going to stomp his face in there. Smart move. Ruby Riott is taking on Natalya. Liv Morgan & Sarah Logan are at ring side. Riott was “helping speed up the grieving process.” Yikes. Even Graves can’t defend the actions of Riott. Natalya has an early flurry. Riott turns things around with a Logan distraction. Nattie powers out of a dragon sleeper. Riott stops a charging Natalya with a back elbow. STO by Riott. Senton from the second rope only gets two. Press Slam by Nattie. She levels Riott with a Discus Clothes Line. Logan & Morgan jump on the apron. Logan dodges. Nattie drop kicks Morgan to eliminate her. Riott rolls up Natalya who reverses and wins the match. Nattie gets out of dodge before Logan & Morgan can attack her.